This Bostitch pancake compressor review will find all the pros and cons of this popular brand. Like we mentioned before we could not find any difference in the air compressor part of both Bostitch Pancake Compressor models. The combo comes with 2 nail guns and a stapler. This will safe you about 125 dollar if you would buy them separate. 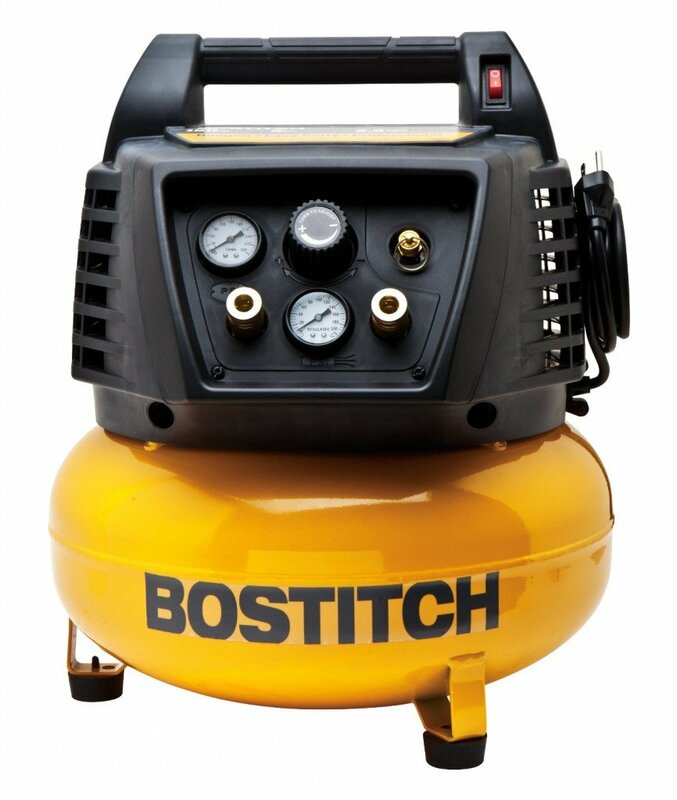 The Bostitch 6 gallon pancake air compressor is about the same size as most portable air compressors. “I bought this compressor to use with my Framing nailer and it works fine forn that service. Might not be acceptable for a pro, but at the rate I build things, it keeps the pressure up fine as I nail together my projects. It is pretty loud, but I guess that goes with the territory when using small pancake style compressors. I did do the recommended break-in before using it (instructions included in another review of this compressor). It is fairly easy to move around with the built-in handle and the plastic case keeps users from getting burns on their hands from the hot cylinder head. After reading a lot of reviews and comments on many sites and forums I still wonder what the 450 hour life hours mean in the description. I will try to contact Bostitch and try to find out and will update it here. With an average rating of 4.2 out of 5 stars and with not too many complaints this 6 gallon pancake air compressor can be considered a good buy for light use in and around the house or construction. Great for finishing and even for framing if you have no need to go fast. If you have a large framing job with more than one nail gun I would recommend a more professional compressor with more power. For smaller jobs this is a great compressor. More and more contractors use these small pancake air compressors because they are easy to take with you and not heavy. There was one complaint that we read several times about the regulator knob being stuck on the first use and you need some force to get it to work. This compressor is made in China and Taiwan according to the manufacturer . Parts are easy to find and available online also. 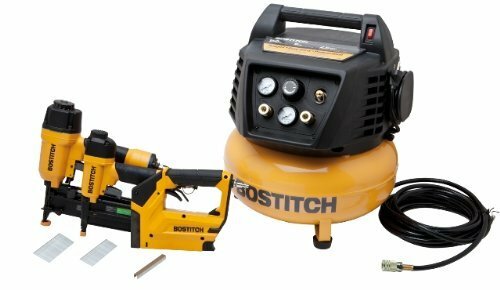 If you are interested in saving some money than the Bostitch pancake compressor combo kit with the 2 nail guns and the stapler gun is a good deal. We have calculated that it would safe you at least $125 if you buy this combo kit. The air guns and stapler got some good ratings, but I also read that the nail gun jammed a lot and had to be cleared. In my opinion this also have to do with the use. These nail guns are not for heavy duty use I guess. Still not sure about if this is the one you are looking for?. have a look at the Porter Cable pancake compressors we reviewed also. Q: Can you use it with a framing nailer? A: Yes, but do no use 2 guns at the same time. A: No this is not made for a spray gun. Can’t keep up with the air flow. A: Maybe for small jobs like a kitchen cabinet door. Not advised however. Read all our pancake air compressor reviews here.